Hieronder lees je nog een stukje wat Kenzi over het interview had geschreven op haar blog. My interview with Fatima was so fun. After we hung up I was exhausted and energized and kinda teary. It was such a joy to talk to someone who is so passionate about her art and especially about Moroccan henna. I often feel like I’m the tree in the forest which no one is there to hear when I talk about Moroccan henna. The henna world is all Indian, all the time and there doesn’t seem to be space for Moroccan henna in that world which makes me very sad. 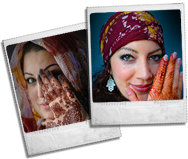 That’s why talking with Fatima, whose passion for Moroccan henna far surpasses mine, was such a treat. Collecting images of her work for this blog post was another pleasure. You can see from the photos that she seriously rocks the Moroccan Fessi style in a way that I rarely see outside of Morocco. I get misty-eyed looking at these designs of hers…nostalgic for Morocco but blown away by someone who conveys the best of Moroccan henna through her work. What is also incredible are her non-Moroccan designs which are also executed with a syringe. Having tried to do henna with a syringe I can barely imagine doing Moroccan designs with them let alone the floral and viney work that Fatima creates. I really love the pieces where she fuses the Moroccan with the Indian in a way that few artists can do. In this sense she is a true Moroccan artist, personifying the crossroads nature of Morocco, picking up influences from all over the world and expertly melding them into a creation that is greater than the sum of its parts.